Today I'm kicking off the giveaway for Color Your Dreams: 100 Inspiring Words, Captivating Coloring Pages & Uplifting Activities by Juliet Madison. 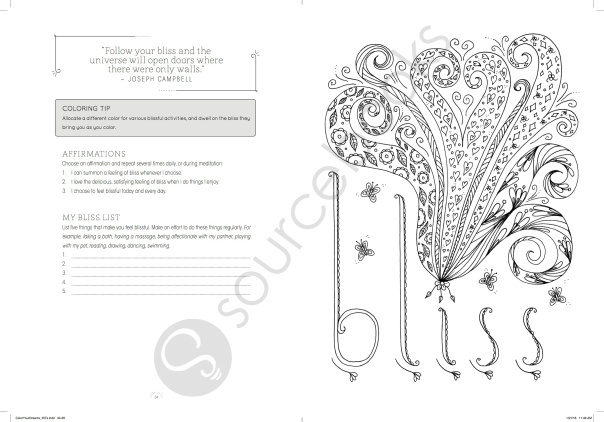 The book is filled with wonderful pages to color with inspiration words such as "Bliss"
I will send one lucky winner a free copy of this book. Please be sure to check out Juliet's Facebook page as well as her website and remember to share share share! If you would like to buy your own copy of the book you can find it for sale here on Amazon. You can enter here - a Rafflecopter giveaway. Facebook, Blogger, Twitter & Rafflecopter are in no way endorsing this giveaway. You are entering your contact information into a Rafflecopter form which I will use to send you an email notification if you are the winner of this book. Due to postage and legalities this is limited to a US winner only. Offer void where prohibited.